what does it feel like to struggle with your mental health? Everyone has a mental health story but we so rarely share it boldly. Through sharing our truth, our inner stories, and real talk struggles, we can breed more connection and development amongst our peers. So often we hide what we think are our weaknesses because we are afraid of judgement and being rejected. However, it is by owning our realness we can open ourselves up to be more okay with ourselves and move forward with confidence, in spite of our struggles. sometimes our emotions feel like they’re bubbling under the surface, ready to boil over. sometimes we feel so emotionally raw, like you could cry at any moment. sometimes our body is so tired and heavy feeling we just want to lie in bed all day. sometimes the panic sits so heavy on our chest we feel like we cannot breathe. sometimes our body is so antsy at bedtime we toss and turn, our mind constantly going through our to-do lists as the time moves on. sometimes we are so overwhelmed and motivated and stuck all at the same time, resulting in a total stalemate with activity. sometimes we cancel all our plans at the last minute because the thought of interacting with anyone is just too much, even if we were excited about the plans. sometimes the loneliness, the disappointment, the everything feels so big that we numb the feelings with a bottle of wine, a bag of chips, a box of cookies. sometimes we want to feel better so badly we research for hours all the things that could help (exercise plans, diet plans, books, articles) and end up wasting an entire day putting together a plan so overwhelming we know we’ll never follow through. sometimes we just get so tired and anxious and worried and depressed all at the same time and instead of asking for help we just push it down and try to carry on. sometimes we need help but are afraid to ask for it because we feel we should know better, can handle it ourselves, can’t justify the expense, can’t find the time. these stories are how mental health issues manifest and build. we keep ignoring, keep fighting on, keep stuffing down, keep isolating, keep not getting better. 💚 being brave to share what we’re experiencing is what will help smash the stigma of asking for help and of talking about our mental health. so be brave. share here. 👉🏽what’s your mental health story? Rather share it 1x1? We get it. 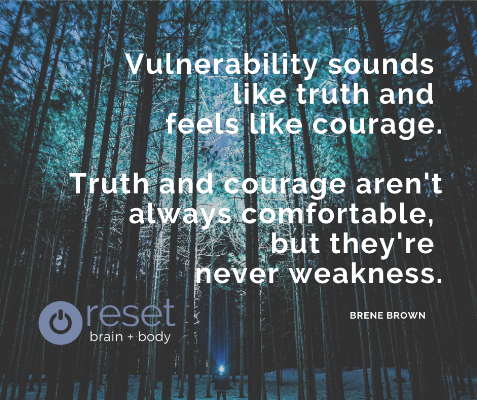 reset brain + body’s mission is to smash the stigma of seeking mental health counseling by creating a community space in the Plymouth area where where yoga is more than just fitness poses, where no problem is too small or too big to ask for help, and where slowing down is celebrated. Contact us to schedule your initial free consultation for counseling or yoga therapy services.